I was recently entrusted with the task of creating an online, registration system for 1700 high school students for a neat event we run at Lake Forest High School called “E Day” – a 3-hour program where students choose breakout sessions and experience fun, new ideas in an atmosphere of creativity and community building. Think sessions like guitar jam, yoga, smoking meats, improv theatre, dorm room design – yeah, it’s super fun. Each student needed to register for one breakout session depending on their lunch period. We wanted to use the GAFE tools in-house to see if we could pull off the registration process. The biggest issue to solve: sessions had to be maxed out at individual numbers (like an event selling out). Could we do this in-house and avoid 3rd party websites? Hello, Google Forms and Add-ons! I’ll walk you through how we pulled this off, and how we solved one unique problem with an even more unique solution. Created a website. Here it is in all its glory – depending on what lunch period students had, they were directed to a different area of the site. (Our Google Forms are domain restricted – I needed the username recorded – so you won’t be able to view the linked sign-up sheets). But I’ll explain it below. Created the mother form. Check it out here – I then copied it about 50 times, because each session needed its own Form. I renamed each Form and put them into separate folders in Drive to help with organization. If you’ve checked out the Form, you are probably wondering two things: Why didn’t you just create one (1) Form and include all 50 sessions as multiple choice options, and why are there so many page breaks? Allow me to explain. So, I tested. Went to a class of 25 students and set a random Form to max out and close down at 10 responses. My worst Form fears came true – all of the students were allowed to complete the Form. It didn’t shut down in time. Although on my end, in the destination response spreadsheet, it only allowed the first 10 people that registered. So, it kind of shut down the responses, but the students registering wouldn’t know this. Ruh Roh. I had a GHO with my friend Corey, and we talked about it. At some point in our conversation, I said, “If only we could administer some sort of a page refresh while students were on the registration site.” Technically, if the page refreshed and a session had filled up, the form would no longer be accessible – which is what we wanted to happen. 5. Set the response destination. I changed the response destinations for all of the breakout sessions to go to one Google Spreadsheet. So in the end I had one spreadsheet with 50 different sheets within – this made it super easy to disseminate rosters to individuals running the sessions, and rescued me from applying sharing rights to 50 different spreadsheets. 6. Put it all together. I had all of the Forms linked on separate Google Docs and embedded them into the Google Site, because – at least for me – its easier and faster to edit a Google Doc than a Site. So, there you have it. 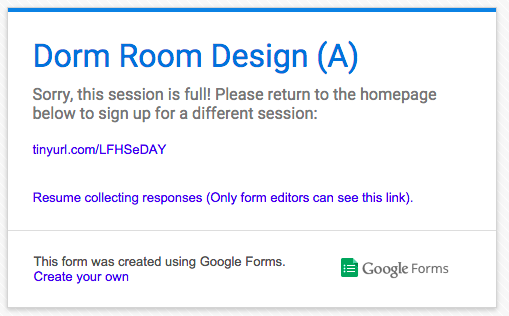 For the TL/DR folks: I used Google Forms, the formLimiter and Form Notifications Add-Ons, Google Sites and Google Docs to run a registration event with 50 breakout sessions. Using these tools, you can have Forms close down when they reach a certain number of registrants, and you can set custom emails for each Form to be sent to registrants upon sign-up. Form page breaks are super important if you are expecting numerous people to access these Forms at the same time. Hopefully that makes sense. Contact me for clarification if you need it – oh, and one more thing. Someone asked me how long it took to build the site and create 50 unique Forms with custom limits and notifications. Not counting the inevitable touch-ups and whatnot, the process took me all of Star Wars, Empire Strikes Back, and half of Return of the Jedi. It’s lovely background noise, don’t you think? Thanks for posting your google forms + Add-ons experience… I was asked to create a volunteer organization assignment/signup, web-based tool and as I piece together the established successes of people like you, it doesn’t seem as daunting. My task is simple in concept but we’ll see how simple it stays as I muddle through…um… I mean “progress through” the steps. Best of luck – email me with questions. In the end it was just a LOT of repetition, but it worked out great. this is great… could you share the template and source.. maybe make a copy of the google folder and or the whole site.. that i can use for a dance weekend event i am doing? we have been struggling with how to use forms practically for registration for a while… do you see how someone could pay as they register for a class also? Hi Greg – let me see if I can figure out how to turn this all into a “template” – so to speak. The problem with copying the Forms is that the Add-on settings don’t come with them (at least I don’t think they do). It’s all in our school domain, so let me see if I can figure out a way to port it to the main Google Sites and make it as a copy-able template. If you have $99 lying around, I HIGHLY recommend eventbrite.com. It’s super easy and powerful, and a great way to make a simple sign-up process for everyone. We may use this in the spring for this event. Great piece, Jimmy! Specifically on the form limiter! I am hosting a small seminar for small business owners showing them how using Google Apps, Switch.co, and UberConference can save them significant amounts of money and make their workflows easier and more efficient. My question is this, how would you add a payment gateway (like Stripe) at the end of the form without taking them out of the form? Hi, I am about to use this excellent method (thank you!) for a similar registration event. Does anyone know if when using Form Limiter if you delete an entry on the responses spreadsheet does it then open that spot back up for someone else to register? Thanks in advance! I’m nearly positive that if you delete it from the response spreadsheet it will NOT reopen that spot on the Google Form. Thanks! Ok, thanks for your quick reply! I wonder if I could in that case of needing to cancel someone from a course and adding a spot, I could just increase the limit? Thank you for this article. I came upon it because I am trying to create a google form for an event that I am hosting. I have four packages with two options each, plus travelling as an additional option I want the persons to select their package and then for them to have a total with the dates of instalments due. Is this even possible? I am working on a room booking system for organizing workshops. My requirements are each workshop is once a week for 5 weeks. There are 2-time frames and I have 8 workshops altogether. I am stuck on the form building part where it is the time and the days of the workshops are being held. because it is not continuous days and I want it to be linked to google calendar so that the respective trainer can view it. This post has been so helpful! I am in charge of organizing a “rewards day” for my students the 1/2 day before Winter Break. I am excited about the ease of this form idea. I am a bit confused by what you mean by page breaks to make sure the page limiter works—can you elaborate??? Thanks!! Hello & thank you for sharing this complex form. I’m would like to use this but I am not sure what website template would be best & I am also unclear about the page breaks. I appreciate any feedback or direction you can give! Hi, thank you for this helpful post! I work at a high school and need to organize a similar type of event. I have a question about your master spreadsheet. I understand how you could print the list of everyone who signed up for Dorm Room Design, but what if, for example, you also needed to print a list of the sessions that everyone from Mrs. Jones’ 3rd period English class signed up for. In that case, you would need to pull information from multiple tabs, i’m assuming. Is that possible in this model? It seems like you would need to have the data from all the tabs on one tab so you could sort by information other than the Session Name. Thank you for your help! Thanks! It sounds like you had a great event and a great system to support it. This explanation certainly was amazing too. I’m trying to make registration forms that allow people to have a permanent link to go back to if they want to make changes later. The form I am designing will need longer responses and being able to do part of it at a time will be likely. Do you have any suggestions? Thanks for these easy-to-understand, step-by-step instructions. I’m in the process of creating sign-up forms for our local PD Day. Do you know of a way for a participant to “cancel” their registration in a session (say, if they wanted to instead register for a different session)? Thanks for sharing this!! Really helpful. Question for you. I may follow these exact steps and run with it, but alternatively I am trying to figure out how to register students on site for an event. So I would have all the students’ info in a googlesheet, but would want a “registrar” to actually sign them in when they got to the event and verify their info is correct. Do you have any suggestions that eliminates students having to register on their own? Thanks!! Hello,I log on to your blog named “Google Forms Add-ons = An Awesome Event Registration System – EdTech Avenger” on a regular basis.Your story-telling style is awesome, keep up the good work! And you can look our website about free proxy list.